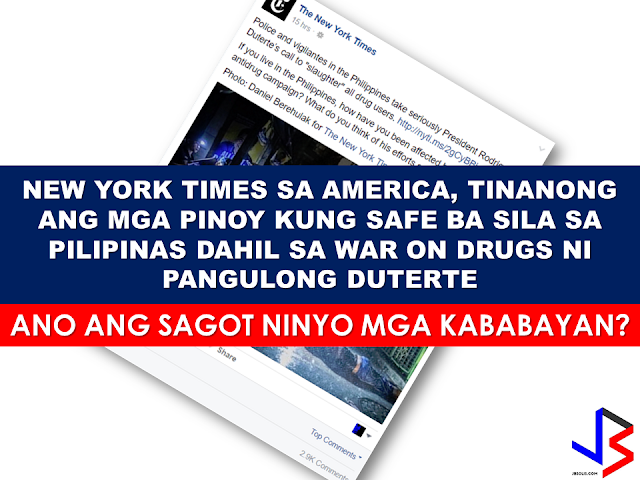 A social media post from The New York Times linked in a somewhat "judgemental" article citing President Rodrigo Duterte's war on drugs as "slaughtering" drug addicts and pushers like animals written by a NYT photo journalist named Daniel Berehulak. With three thousand comments as of this writing, most respondents speak their mind with majority of which are saying that they are fine and feel safer under the Duterte leadership in spite of the so called "EJKs". 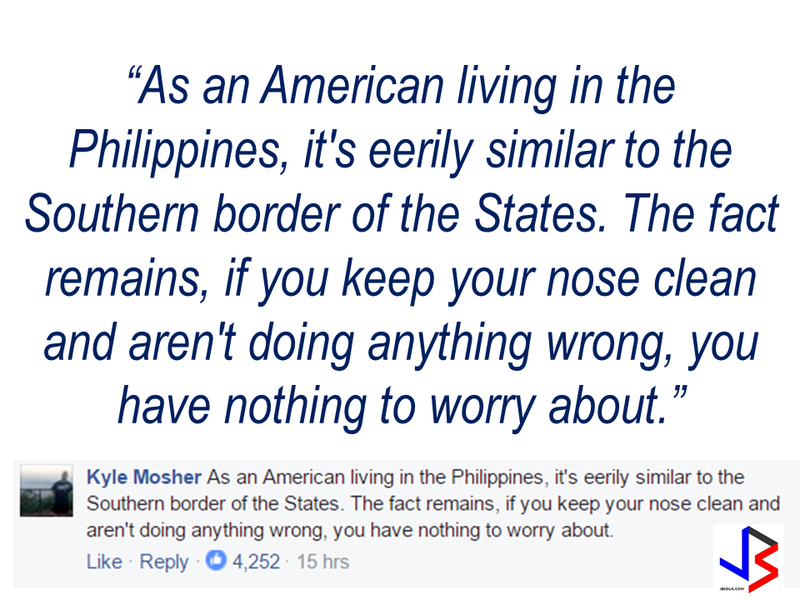 One comment that got about nearly five thousand thumbs ups, is from "an American living in the Philippines" by the name of Kyle Mosher. 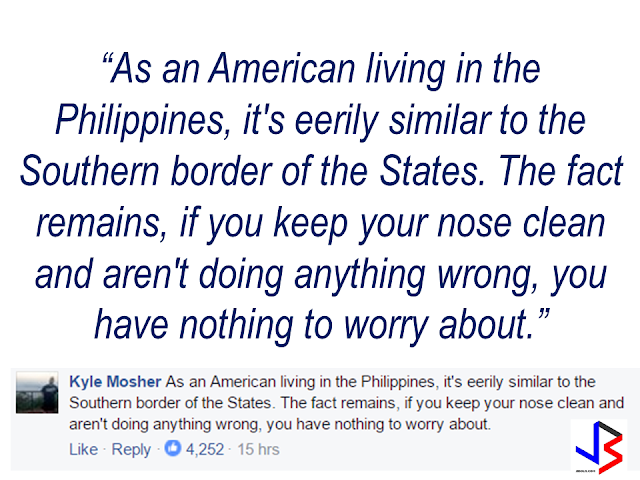 He said: "As an American living in the Philippines, it's eerily similar to the Southern border of the States. The fact remains, if you keep your nose clean and aren't doing anything wrong, you have nothing to worry about." 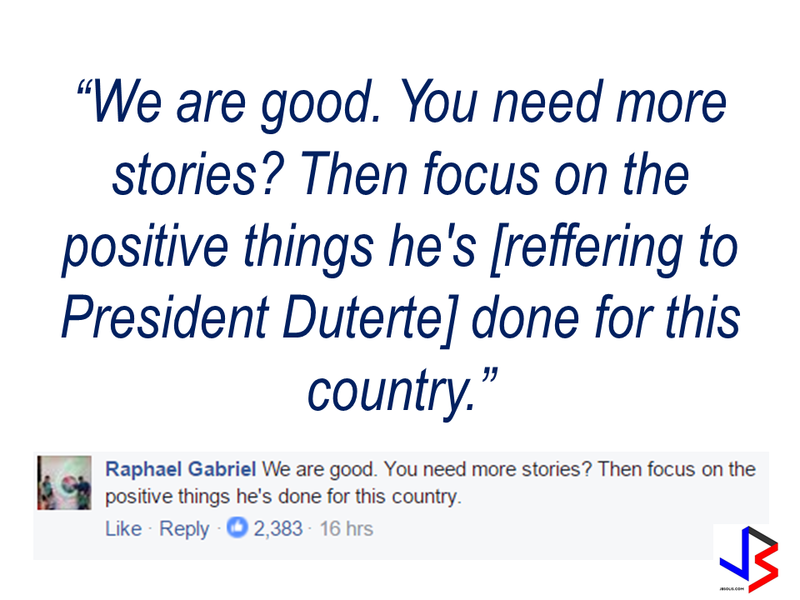 Slamming the recent trend of local and foreign media focusing only on the so called "killings" and negative news about president Duterte without putting the accomplishments and good results of his leadership in the highlights. 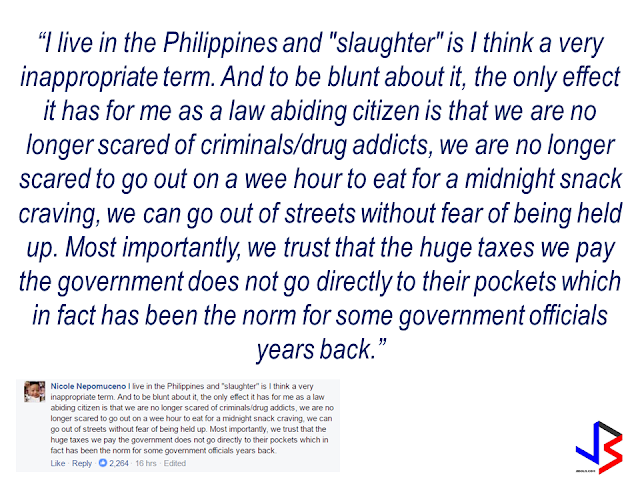 Another commenter also said that the word "slaughter" is not an appropriate term to be used to describe the deaths resulted from the present war on drugs. She said that Filipinos feel safer now to go outside and walk anytime without the fear of being mugged by drug addicts like before and that the taxes paid by the citizens will not go directly inside the plunderers pockets. 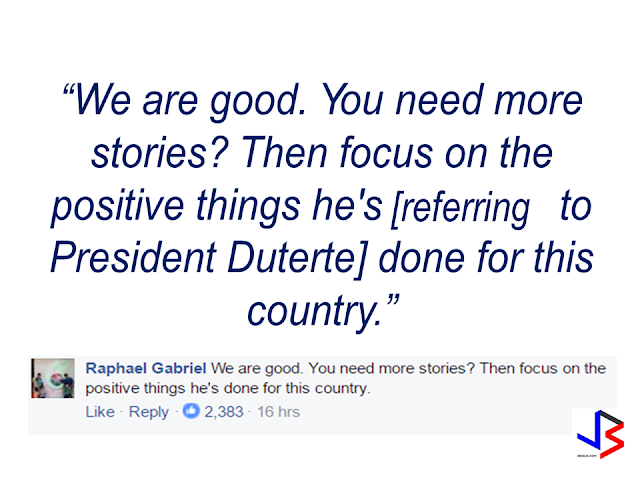 Despite the obviously biased write-up with intent to darken and make President Duterte's war against drugs morbid and inhumane, the Filipinos, to where the question is being addressed, stood for what is really happening in the midst of growing "cloud of fear" from the campaign to eliminate the worst cancer of society, which is drug addiction. 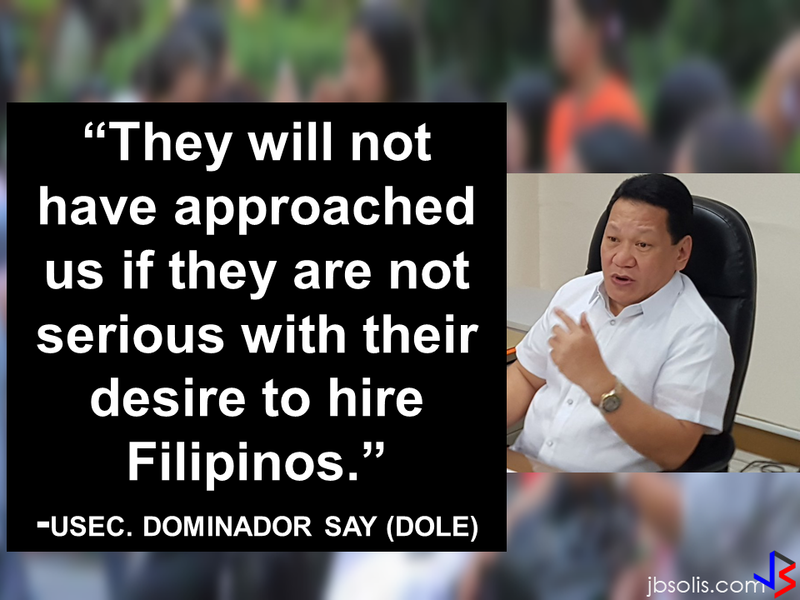 There is indeed "fear" , but not in the hearts of the law abiding Filipinos but only in the hearts of the criminals, the drug lords, which is the real target of the President's war on drugs. You can read the New York Times article in Tagalog here. NYT original facebook post here.